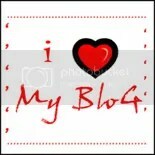 A Review on Secure.Me | THE PORTICO.. Most of internet users are connected in Facebook and for some of them, Facebook has became a strong addiction and so they daily does “Facebooking” (Still i know persons who don’t use and hate Facebook as a social network). Anyway, now Facebook is facing some serious challenges by hackers and scams which doubles day by day. we had reported some of those scams about one month before. So a Facebook privacy protector service like secure me is essential in this stage. Secure.me is enough to complete this importance due to its cool features and demand of such service. Secure.me is offering you a 3 months free period of their service so you must get premium plan after 3 months, if you want to continue with this. Secure.me is an awesome service which helps you to keep your or your child’s Facebook account as safer as possible. i am writing this review in the basis of my own Facebook account by registering it to secure.me. Secure.me provides some useful facilities like Privacy Analysis, Profile Analysis, Network Analysis and Photo Analysis. They have been moving with your services through combining with Avira. They have collaborated with Avira to improve online security and personal data and privacy protection for Facebook users. As part of the cooperation, Avira will offer its customers in the US and Canada a bundled product package enabling better personal data and privacy control on Facebook. When we open this service’s dashboard, its much simple with its nice color combination and simple but efficient design. in left side, you can see a container with black background which displays link for profile analysis and such services. Privacy Analysis feature included in secure.me helps to find and fix failures in your Facebook profile which leads to privacy problems. secure.me also shows an rank for our Facebook profile based on privacy threats. 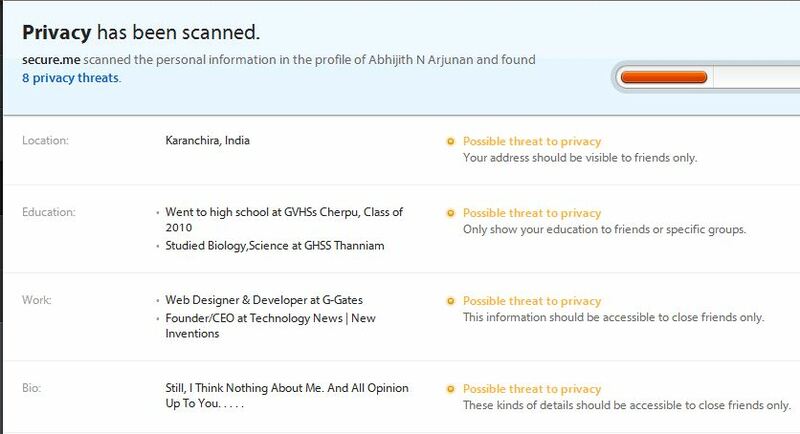 When i scanned my privacy using secure.me it was seen 8 privacy threats. Some details about our job, location, and education are considered as threat in the view of secure.me. Profile Analysis is the next important feature. Here secure.me looks at our profile and finds errors and questionable posts in our profile. This system also displays about source of posts in our profile and trends of posts’s content. interesting criteria ‘Mood Of Profile’ is also included in this with remarking our profile with positive/negative/neutral. Networks are much important than profile in social networks right ? 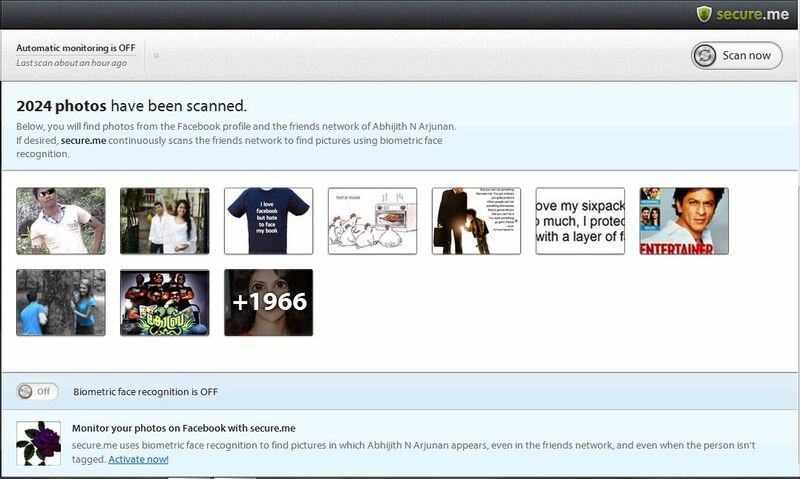 thats why secure.me have arranged an total scanning function for networks in Facebook account. This network scan analyses each post done by your networks and marks abusive and questionable content as a threat to account. Here is also a bar which displays trends and mood of networked friends. Now, photos have more importance in Facebook, as a social networks. And the tagging has been making some privacy problems which leads to deleting of account. Secure.me has a solution for this problem too. They will scan photos uploaded by ourselves as well as friends and finds some threats too. There is a new facility named ‘Biometric Face Recognition’ this feature is much useful for who are totally hating useless photo tagging. If we activate this function, we must upload our original photo then secure.me will access tagged photos and report if there is any nonsense tags. This is a very useful and informative post.Thanks a lot for sharing this bit of information. And I did like the review so much specially the way it covers this new service!